Get your home into top shape with All Weather Coating’s exterior wall rendering service. Traditionally, render is composed of a layer of sand, cement and water and is applied to the outside of an external wall for both practical and protective purposes. Nowadays, render is comprised of more modern materials. The most popular form of render currently used in the UK – k rend – also incorporates silicone into its mixture, improving the render’s ability to repel water. Waterproof render for external walls is important for durability and longevity. The exterior of your home can take a beating over the years and if the outside is rendered then you may start to notice cracking, flaking or even breakage in places. You don’t have to panic and lump yourself with a costly re-rending for the whole outside of your home. Here at All Weather Coating, we provide two services that can help alleviate your problems – for a fraction of the price! Our render restoration service is perfect for those who don’t want to pay through the nose for house exterior rendering. We will target the affected areas where the render is not up to the quality standard it should be and repair them with care. No need for a costly property development when you can go to the problem at its source! After your exterior rendering has been fully repaired, we would also recommend coupling this with our wall coating service! Our wall coatings are guaranteed for twenty-five years, that’s how confident we are in our product. 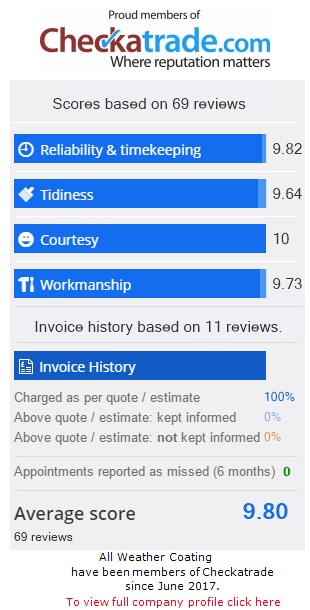 And don’t just take our word for it, the quality of the render used in our exterior wall coatings has been verified by reviews that you can view on our homepage. We are determined to get your home to the standard it needs to be at for a more-than-reasonable cost. If you would like some home improvements at an economical rate then please do get in touch. Contact us today (either by phone, email or our contact form) and we will get back to you as soon as humanly possible – we can arrange a free quote for you so you know exactly how much the job is going to cost in pounds and pence and you can finally put the ‘how much to render a house’ question to rest.